A country's foreign policy, also called foreign relations or foreign affairs policy, consists of self-interest strategies chosen by the state to safeguard its national interests and to achieve goals within its international relations milieu. The approaches are strategically employed to interact with other countries. The study of such strategies is called foreign policy analysis. In recent times, due to the deepening level of globalization and transnational activities, the states will also have to interact with non-state actors. The aforementioned interaction is evaluated and monitored in attempts to maximize the benefits of multilateral international cooperation. Since the national interests are paramount, foreign policies are designed by the government through high-level decision-making processes. National interests accomplishment can occur as a result of peaceful cooperation with other nations, or through exploitation. Usually, creating foreign policy is the job of the head of government and the foreign minister. In some countries, the legislature also has considerable effects. Foreign policies of countries have varying rates of change and scopes of intent, which can be affected by factors that change the perceived national interests or even affect the stability of the country itself. The foreign policy of a country can have a profound and lasting impact on many other countries and on the course of international relations as a whole, such as the Monroe Doctrine conflicting with the mercantilism policies of 19th-century European countries and the goals of independence of newly formed Central American and South American countries. On 29 March 2017, the United Kingdom (UK) invoked Article 50 of the Treaty on European Union (TEU) which began the member state's withdrawal, commonly known as Brexit, from the European Union (EU). In compliance with the TEU, the UK gave formal notice to the European Council of its intention to withdraw from the EU to allow withdrawal negotiations to begin. Slovak or less frequently Slovakian is a West Slavic language. It is called slovenský jazyk or slovenčina in the language itself. 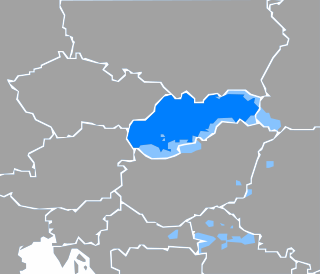 Belarusian is an official language of Belarus, along with Russian, and is also spoken in Russia, Poland and Ukraine. Before Belarus gained independence from the Soviet Union in 1991, the language was only known in English as Byelorussian or Belorussian, transliterating the Russian name, белорусский язык Belorusskiy yazyk, or alternatively as White Ruthenian or White Russian. Following independence, it has acquired the additional name Belarusian. ↑ On 3 October 1990, the constituent states of the former German Democratic Republic acceded to the Federal Republic of Germany, automatically becoming part of the EU. ↑ The Frisian language is not an official language of the European Union. ↑ Welsh and Scottish Gaelic are co-official languages alongside English in their respective territories, allowing their use in E.U. institutions under limited circumstances. Scots, Cornish, and Irish, along with British Sign Language, are officially recognized minority languages in the U.K., but have no official E.U. status. According to the Copenhagen criteria, membership of the European Union is open to any European country that is a stable, free-market liberal democracy that respects the rule of law and human rights. Furthermore, it has to be willing to accept all the obligations of membership, such as adopting all previously agreed law (the 170,000 pages of acquis communautaire) and switching to the euro. To join the European Union, it is required for all member states to agree; if a single member state disagrees, the applying country is declined accession to the European Union. In addition to enlargement by adding new countries, the EU can also expand by having territories of member states, which are outside the EU, integrate more closely (for example in respect to the dissolution of the Netherlands Antilles) or by a territory of a member state which had previously seceded and then rejoined (see withdrawal below). The Copenhagen Criteria are the rules that define whether a country is eligible to join the European Union. The criteria require that a state has the institutions to preserve democratic governance and human rights, has a functioning market economy, and accepts the obligations and intent of the EU. 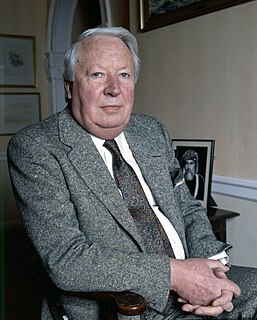 Sir Edward Richard George Heath, often known as Ted Heath, was a British politician who served as Prime Minister of the United Kingdom from 1970 to 1974 and Leader of the Conservative Party from 1965 to 1975. He was a strong supporter of the European Communities (EC), and after winning the decisive vote in the House of Commons by 336 to 244, he led the negotiations that culminated in Britain's entry into the EC on 1 January 1973. It was, says biographer John Campbell, "Heath's finest hour". Although he planned to be an innovator as Prime Minister, his government foundered on economic difficulties, including high inflation and major strikes. He became an embittered critic of Margaret Thatcher, who supplanted him as Tory leader. Georges Jean Raymond Pompidou was Prime Minister of France from 1962 to 1968—the longest tenure in the position's history—and later President of the French Republic from 1969 until his death in 1974. He had long been a top aide to president Charles de Gaulle. As president, he was a moderate conservative who repaired France's relationship with the United States and maintained positive relations with the newly independent former colonies in Africa. There are a number of overseas member state territories which are legally part of the EU, but have certain exemptions based on their remoteness. These "outermost regions" have partial application of EU law and in some cases are outside of Schengen or the EU VAT area—however they are legally within the EU. They all use the euro as their currency. Entry to the EU is limited to liberal democracies and Freedom House ranks all EU states as being totally free electoral democracies. All but 4 are ranked at the top 1.0 rating. However, the exact political system of a state is not limited, with each state having its own system based on its historical evolution. The Lisbon Treaty made the first provision of a member state to leave. The procedure for a state to leave is outlined in TEU Article 50 which also makes clear that "Any Member State may decide to withdraw from the Union in accordance with its own constitutional requirements". Although it calls for a negotiated withdrawal between the seceding state and the rest of the EU, if no agreement is reached two years after the seceding state notifying of its intention to leave, it would cease to be subject to the treaties anyway (thus ensuring a right to unilateral withdrawal). There is no formal limit to how much time a member state can take between adopting a policy of withdrawal, and actually triggering Article 50. However, there is also the largely defunct term of associate member. It has occasionally been applied to states which have signed an association agreement with the EU. Associate membership is not a formal classification and does not entitle the state to any of the representation of free movement rights that full membership allows. The term is almost unheard of in the modern context and was primarily used in the earlier days of the EU with countries such as Greece and Turkey. Turkey's association agreement was the 1963 Ankara Agreement, implying that Turkey became an associate member that year. Present association agreements include the Stabilisation and Association Agreements with the western Balkans; these states are no longer termed "associate members". The Treaty of Nice was signed by European leaders on 26 February 2001 and came into force on 1 February 2003. The special territories of the European Union are 31 territories of EU member states which, for historical, geographical, or political reasons, enjoy special status within or outside the European Union. The special territories divide themselves in two categories: 9Outermost Regions (OMR) that form part of the European Union, though they benefit from derogations from some EU laws due to their geographical remoteness from mainland Europe; and 22 Overseas Countries and Territories (OCT) that do not form part of the European Union, though they cooperate with the EU via the Overseas Countries and Territories Association. Multi-speed Europe or two-speed Europe is the idea that different parts of the European Union should integrate at different levels and pace depending on the political situation in each individual country. Indeed, multi-speed Europe is currently a reality, with only a subset of EU countries being members of the eurozone and of the Schengen area. Like other forms of differentiatedintegration such as à la carte and variable geometry, "multi-speed Europe" arguably aims to salvage the "widening and deepening of the European Union" in the face of political opposition. Turkey is negotiating its accession to the European Union (EU) as a member state, following its application accede to the European Economic Community, the predecessor of the EU, on 14 April 1987. After the ten founding members, Turkey was one of the first countries to become a member of the Council of Europe in 1949. 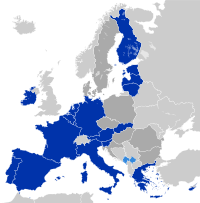 The country was also an associate member of the Western European Union from 1992 to its end in 2011. Turkey signed a Customs Union agreement with the EU in 1995 and was officially recognised as a candidate for full membership on 12 December 1999, at the Helsinki summit of the European Council. Withdrawal from the European Union is the legal and political process whereby an EU member state ceases to be a member of the Union. Article 50 of the Treaty on European Union (TEU) states that "Any Member State may decide to withdraw from the Union in accordance with its own constitutional requirements". The Republic of Albania has been an official candidate for accession to the European Union (EU) since June 2014 and is on the current agenda for future enlargement of the EU. Accession of Kosovo to the European Union (EU) is on the current agenda for future enlargement of the EU and Kosovo is recognized by the EU as a potential candidate for accession. Kosovo's declaration of independence from Serbia was enacted on 17 February 2008 by a vote of members of the Assembly of Kosovo. Independence has not been recognised by Serbia, or five out of 28 EU member states, and as a result the European Union itself refers only to "Kosovo*", with an asterisked footnote containing the text agreed to by the Belgrade–Pristina negotiations: "This designation is without prejudice to positions on status, and is in line with UNSCR 1244 and the ICJ Opinion on the Kosovo Declaration of Independence." This has not prevented Kosovo from continuing its EU enacted Stabilisation Tracking Mechanism (STM) programme, aiming to gradually integrate its national policies on legal, economic and social matters with the EU, so that at some point in the future they could qualify for EU membership. There are five recognised candidates for future membership of the European Union: Turkey, North Macedonia, Montenegro, Albania, and Serbia. All except Albania and North Macedonia have started accession negotiations. Kosovo, whose independence is not recognised by five EU member states, and Bosnia and Herzegovina are recognised as potential candidates for membership by the EU. Bosnia and Herzegovina has formally submitted an application for membership, while Kosovo has a Stabilisation and Association Agreement (SAA) with the EU, which generally precedes the lodging of membership application. In July 2014, Jean-Claude Juncker announced that the EU had no plans to expand before 2019, while Serbia and Montenegro, the most advanced candidates, are both expected to join before 2025. While the others are progressing, Turkish talks are at an effective standstill. Since the 1980s, member states of the European Union have started to harmonise aspects of the designs of their ordinary passports, as well as common security features and biometrics. Relations between the European Union (EU) and Turkey were established in 1959, and the institutional framework was formalized with the 1963 Ankara Agreement. Turkey is one of the EU's main partners in the Middle East and both are members of the European Union–Turkey Customs Union. The EU and Turkey have a common land border through the EU member states Bulgaria and Greece. Poland has been a member state of the European Union since 1 May 2004, with the Treaty of Accession 2003 signed on 16 April 2003 in Athens as the legal basis for Poland's accession to the EU. The actual process of integrating Poland into the EU began with Poland's application for membership in Athens on 8 April 1994, and then the confirmation of the application by all member states in Essen from 9–10 December 1994. Poland's integration into the European Union is a dynamic and continuously ongoing process. Article 7 of the Treaty on European Union is a procedure in the treaties of the European Union (EU) to suspend certain rights from a member state. While rights can be suspended, there is no mechanism to expel a member. ↑ "Eurostat – Population on 1 January 2018". European Commission . Retrieved 13 July 2018. 1 2 3 4 5 6 7 8 9 10 11 12 13 14 15 16 17 18 19 20 21 22 23 24 25 26 27 28 Council Decision of 12 December 2017 (). 1 2 3 4 5 6 7 8 9 10 11 12 13 14 15 16 17 18 19 20 21 22 23 24 25 26 27 28 "IMF". www.imf.org. Retrieved 30 January 2018. 1 2 3 4 5 6 7 8 9 10 11 12 13 14 15 16 17 18 19 20 21 22 23 24 25 26 27 28 "UNDP.org". hdrstats.undp.org. Archived from the original on 17 October 2009. 1 2 3 4 5 6 7 8 9 10 11 12 13 14 15 16 17 18 19 20 21 22 23 24 25 26 27 28 "Human Development Report 2018 – "Human Development Indices and Indicators: 2018 Statistical Update" (PDF). HDRO (Human Development Report Office) United Nations Development Programme. p. 22. Retrieved 8 October 2018. ↑ Anonymous (5 July 2016). "Living in the EU - European Union - European Commission". European Union. 1 2 "Regional and minority languages in the European Union" (PDF) (PDF). European Parliament Members' Research Service. September 2016. Retrieved 16 January 2019. ↑ "Prime Minister's letter to Donald Tusk triggering Article 50". Government of the United Kingdom. 29 March 2017. Retrieved 1 July 2017. ↑ "Confirmation of UK Government agreement to Article 50 extension". Government of the United Kingdom. 22 March 2019. Retrieved 1 April 2019. ↑ "Accession criteria". Europa. Archived from the original on 9 February 2008. Retrieved 25 August 2008. ↑ European Commission (18 January 2016). "EU by topic: Enlargement" . Retrieved 11 March 2016. ↑ "1971 Year in Review". United Press International. Archived from the original on 5 May 2009. ↑ "Ever closer union: joining the Community". BBC News. ↑ "Norway Has Rejected the EU But Cannot Ignore It". The Daily Telegraph. 1 2 3 "A short history of the European Union". EURAC Research. 29 May 2004. Archived from the original on 17 November 2008. Retrieved 25 August 2008. ↑ "W. Europe Bloc Bars Morocco as a Member". Los Angeles Times . 21 July 1987. Retrieved 25 August 2008. ↑ British Embassy, Bern (4 July 2006). "EU and Switzerland". The UK & Switzerland. Archived from the original on 28 April 2006. Retrieved 4 July 2006. ↑ "History of the European Union". Europa . Retrieved 25 August 2008. ↑ "From 6 to 28 members". European Commission. 2016. ↑ "European Neighbourhood Policy And Enlargement Negotiations: Check current status" . Retrieved 19 July 2017. ↑ Aydıntaşbaş, Asli (12 July 2017). "Window of opportunity closes on Cyprus reunification". European Council on Foreign Relations. 1 2 de La Baume, Maïa (25 July 2017). "Turkey and the EU still miles apart on membership". Politico. ↑ "EU parliament calls for Turkey accession talks to be suspended". 6 July 2017 – via Reuters. ↑ "European Union – Guide". politics.co.uk. Archived from the original on 25 August 2014. Retrieved 14 May 2016. Member states take it in turns to assume the presidency of the Council of Ministers for six months at a time in accordance with a pre-established rota. ↑ "The European Parliament: Historical Background" . Retrieved 14 May 2016. ↑ "Previous UK European elections". BBC News. 2 June 1999. Archived from the original on 24 April 2003. Retrieved 14 May 2016. The 1951 treaty which created the European Coal and Steel Community (a precursor to the European Economic Community and later European Union) provided for a representative assembly of members drawn from the participating nations' national parliaments. In June 1979, the nine EEC countries held the first direct elections to the European Parliament. ↑ Peel, Q; et al. (26 March 2010). "Deal shows Merkel has staked out strong role]". Financial Times . ↑ Kirschbaum, Erik (3 July 2011) "Greek sovereignty to be massively limited: Juncker". Reuters. ↑ Phillips, Leigh (7 September 2011). "Netherlands: Indebted states must be made 'wards' of the commission or leave euro". EU Observer . ↑ Eder, Florian (13 September 2017). "Juncker to oppose multispeed Europe". Politico. ↑ "Freedom in the World 2018: Democracy in Crisis". Freedom House. 2018. ↑ "Freedom in the World 2018: Table of Country Scores". Freedom House. 2018. Archived from the original on 11 April 2018. ↑ McGarry, John (2010). Weller, Marc; Nobbs, Katherine (eds.). Asymmetric Autonomy and the Settlement of Ethnic Conflicts. Philadelphia: University of Pennsylvania Press. pp. 148–179. ISBN 978-0-8122-4230-0. ↑ Elgot, Jessica (2 October 2016). "Theresa May to trigger article 50 by end of March 2017". The Guardian. ↑ "EUTurkey relations". EurActiv. 14 November 2005. Archived from the original on 6 July 2008. Retrieved 4 March 2010. 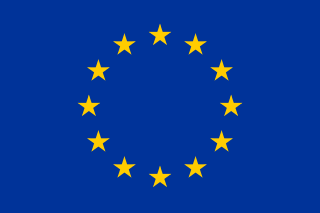 Wikimedia Commons has media related to Members of the European Union .